Baby chicks or clean children? Because apparently, I can’t have both. We received a call a week ago last Sunday. The baby chicks I ordered from McMurray Hatchery had arrived a week earlier than expected. Our house was in a tizzy —-Sid began planning a temporary chicken tractor, the children squealed in anticipation, and I called my mom to see if she wanted to ride with me to pick up our chicks. It was a rare and unexpected opportunity to spend a few hours with only my Mom. We picked up my cheeping package, and ran to Tractor Supply to buy feeder, waterers, wood shavings. When I arrived home with my poulty bounty, some very happy children greeted me . 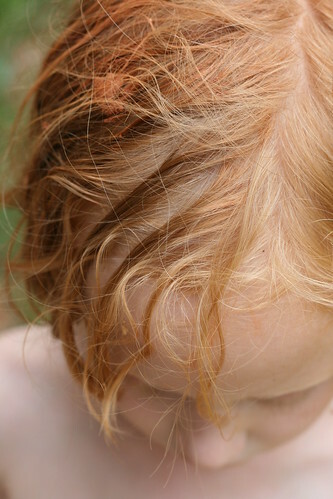 . . . . . .
Then I saw the clump of red clay in her hair. “Nevermind,” I said. 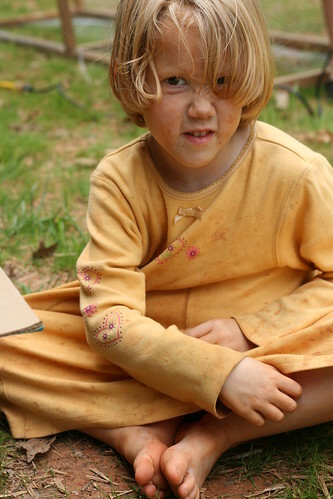 I dreaded discovering what her clothes looked like. I meant to focus on the baby chick in her lap, but my attention was caught on those dirty, dirty, little feet and toes. which meant his clothes must look as bad as Rachel’s. And the robe is the ONLY thing he is wearing. He got behind on washing his clothes again, and now he must suffer the consequences. Does he look like he is suffering? Why doesn’t he look like he is suffering? 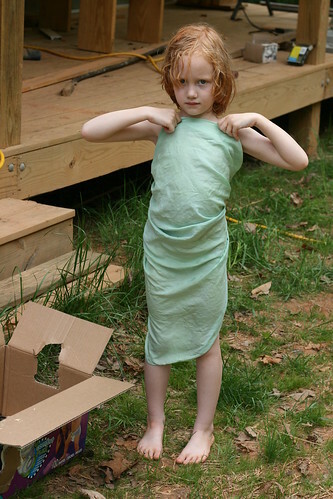 Why, oh why can’t I keep my children clean and appropriately clothed? I looked down at our baby chicks. I focused on their fragility, their soft fluff, their soft little peeps. I found my happy place and forgot my 2-second obsession for clean, properly clothed children. 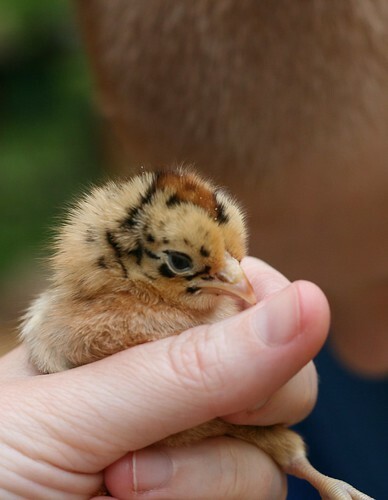 No worries here — we have baby chicks! 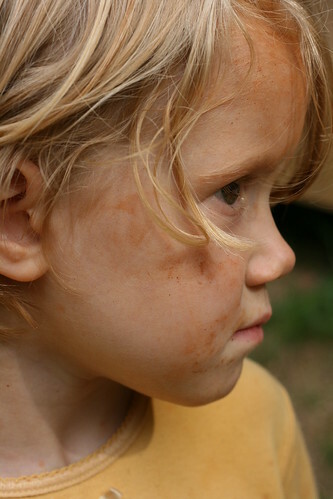 My dirt-coated, improperly clothed children anticipate watching him grow and trying to figure out what breed he is. 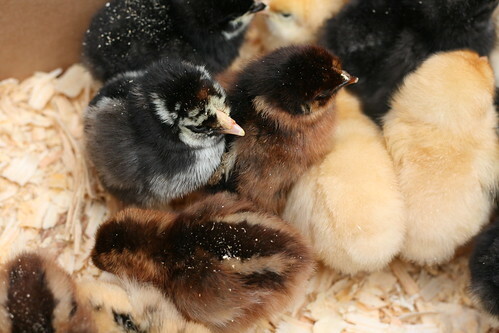 Along with the mystery chick, we have Buff Orpingtons, Dominques, Speckled Sussex, Partridge Rocks and Silver Laced Wyandottes. It is my understanding that chickens like to take dirt baths. Maybe they will mistake my kids for other chickens and be really, really tame. 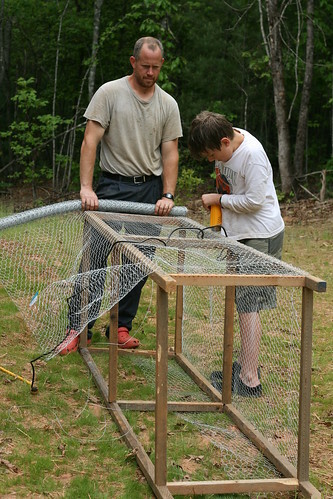 Sid and the boys worked on a temporary chicken tractor so the chicks can safely graze in our yard. And one more picture . . . . . .